These favorite rose petal sandwiches are a Rosemary House original tea party sandwich, served during special gatherings in the garden. 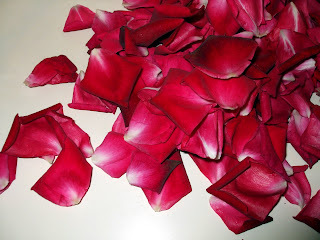 Harvest fresh rose petals (organic, un-sprayed); and rinse carefully. Lightly pat dry. Mix rose water (1 - 2 tsps.) with 8 oz. softened cream cheese. You want to add enough rose water to flavor and soften the cream cheese without making it too runny. Add slowly at first, you can always add more rose water if necessary. Spread a thin layer of cream cheese on soft white bread. Cover one layer of bread fully with the rose petals. 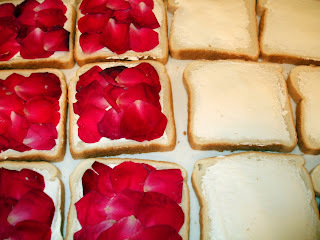 Place another cream cheese covered bread over top of the rose petals. 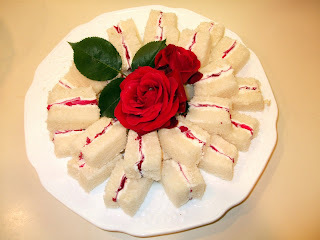 With a serrated knife, remove the crusts; cut the sandwich in half, and then each half in thirds; so you have small bite size rose petal sandwiches. 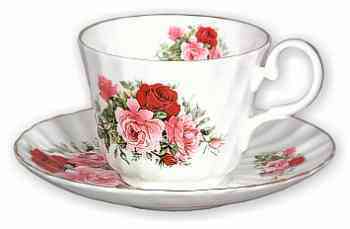 Place the little sandwiches in a circular pattern on your plate; and garnish with fresh roses. Cover with wax paper and saran wrap until you are ready to serve these dainty little tidbits. 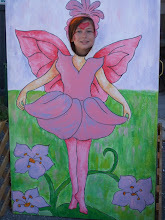 What a perfect addition to a garden party. These sound delightful, not only pleasing to the eye but the palette as well. I make an organic rosepetal jelly that requires the infusion of rosewater so I can just imagine the fragrance from these sandwiches. What a gorgeous sandwich and presentation! Thank you for the instructions! Those are stunning! I don't know why I can't get past the fact that you're eating a flower. I have absolutely no concept of what that must taste like. I guess I'll just have to try them sometime to see! I was just thinking of this and decided to see how you make it. Thanks! Taking Tea and Playing Tag!